I am an artist and maker based in Brighton, UK. I make art inspired by physics, geometry and astronomy – often using everyday or recycled materials to make these abstract subjects tangible, relatable and fun. My work includes drawing machines made from bicycles and spherical sculptures made from mass-produced materials. I have given workshops at schools and science events, and exhibited internationally in countries including Canada and Uzbekistan. 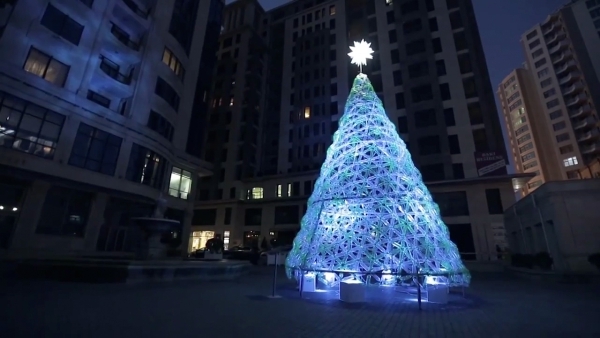 In December 2013, I was commissioned to make a New Year Tree in Baku – capital of Azerbaijan – by IDEA Public Union, an environmental awareness campaign. The structure was made from over 2,000 green and white recycled plastic bottles, held together with cable ties in a triangular pattern. The design was inspired by islamic tiling and architecture, and by mathematical beading structures I’d seen at Bridges conferences. The conic shape was formed by making two connected triangular meshes of bottles joined at the sides (3, 4 or 5 meshes joined together would have made successively shallower cones). For the construction process, we were assisted by local students. The mesh of bottles was supported by a metal framework made at a local steelworks.